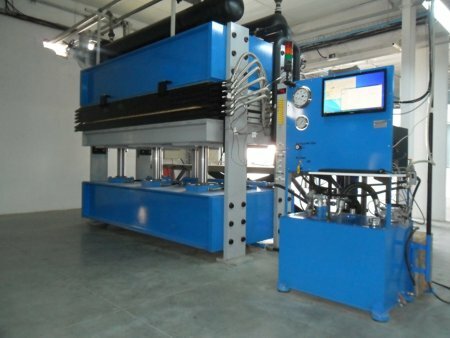 Hydraulic Platen Press: Click Here For Additional Hydraulic Press Information. New for 2017 are our SDM Laminator with MaxRamp II platens. Temperature ramp rates of 10°C per/min. for shortest cycle times available for increased productivity. Our latest SDM Laminator delivered in February of 2016 to Zodiac Aerospace Tunisia, is our most advanced composite press. SDM Technology's Laminator series of presses has dominated the Aerospace market over the last 20 years. Every major aircraft panel manufacturer in the United States, United Kingdom and Europe use our equipment to manufacture aircraft interior panels. Phenolic faced honeycomb panels, like Boeing's BAG 5564, are used extensively in aircraft interiors. Our new SDM Laminators will process these panels with the highest physical performance and shortest available cycle times. There is no finer composite press available today. Our SDM laminators feature automatic and manual controls. They include full process control with data acquisition and monitoring. They feature internet with PC accessiblility for flexible software updates and additions. These include multiple bump cycle programming options. Our in house 1885 Ton, 5 opening Laminator HD will apply over 400 PSI on a 5' x 12' laminate. Platen size is 66" x 148". Process temperatures now span from 90 to 675°F. The cooling system is available with the our 140 Ton Stage III Stainless Super Exchangers. Heating capacity has been increased to 2 million BTU. These changes dramatically expand our processing ranges and will provide our customers new ways to process large laminates previously not available. SDM has designed production equipment to process laminates at 4,200 to 8,400 PSI at 675°F, SDM has produced, in our current SDM 1885 Laminator HD armor at these pressures and temperatures. This will produce current state armor for military and police. SDM has produced the highest quality Laminates (Armor, PPS/Carbon and UHMW Polyethylene) and Honeycomb Panels available for Military, Aerospace or Commercial use. Our equipment was used to qualify Aircraft Floors, Military Enclosures, Interior Honeycomb Panels, Carbon, Kevlar and Spectra Laminates to Boeing, General Dynamics, Lockheed and many others. With our new equipment, Thermosets and Thermoforms resin can be produced into large laminates efficiently. Difficult thermoforms like PEEK, Spectra, PPS, Nylon, and many others, are efficiently processed. SDM supplied Armorworks with the Kevlar laminates to retrofit the Hnmvee fleet. Our presses are also used to make the large California freeway signs and exterior stone faced panels for buildings. SDM has produced composite presses beginning in 1982, Our current 1885 Ton Laminator is being updated with our MaxRamp II Platens that are new for 2017, New Bolster designs and Max Ramp II Platen technology has yielded a press with unmatched temperature (plus/minus 1.0°C) along with extremely uniform pressure delivery. Combined with our new expanded processing temperature range, 675°F, and supporting SDM Stage III Super Exchangers, No one has our Temperature and Pressure capability to process Large Composite Laminates and Honeycomb structures. Contact SDM for Further Information and a Quote!